Consumers have been familiar with the pyramid design since 1992. 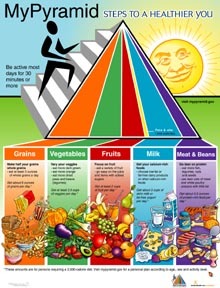 The graphic placed breads and grains on the bottom foundation, supporting tiers of vegetables, fruits, dairy, meats and proteins, and lastly fats and sweets. A new pyramid of sorts replaced this design in 2005 called MyPyramid (at right), which uses color codes for each food group instead. It emphasizes the importance of exercise and dietary variety, and de-emphasizes a foundation of breads and grains. But according to Dr. Robert C. Post from WebMD, the latest pyramid design hasn't been memorable enough to make a difference. He said that any new design is meant to inspire the public, encouraging people to make healthy eating choices, especially when it comes to grocery stores and restaurants. The new plate-shaped design is intended to be easily understood at a glance. The plates will be cut into wedges, color-coded for vegetables, fruits, grains, and proteins. A separate, smaller plate of dairy will appear on the side. Additionally, tomorrow's announcement will be coupled by a Vegetarian Power Plate that breaks up food groups into fruits, vegetables, grains, and legumes. First lady Michelle Obama and Agriculture Secretary Tom Vilsack will make the announcement Thursday, June 2 at 10:30 a.m. EST streamed live at www.usda.gov/live.